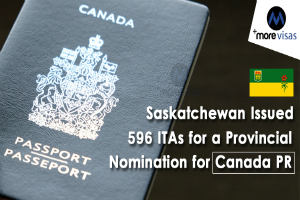 Saskatchewan has declared 596 invitations to appeal for a provincial nomination for Canadian PR in its opening draws of Express Entry and Occupation In-Demand in 2019. A sum of 362 invitations went to applicants in the Program of Saskatchewan Immigrant Nominee- a sub-category of Express Entry, which is associated to the Canada Express Entry system and enables Saskatchewan to nominate qualified applicants for PR. Express Entry applicants who get a provincial nomination are given an additional 600 points to their ranking score of Express Entry, which effectively ensures an invitation from the Canadian Government to apply for PR. Express Entry applicants should have work experience in a high-skilled profession found on In-Demand Professions List of Saskatchewan, among other eligibility requirements. Saskatchewan also announced 234 invitations to profession In-Demand applicants. This sub-category is not associated with the Canada Express Entry system and is accessible to international workers with work experience in one of the In-demand professions of Saskatchewan, among other requirements. A job offer from an employer of Saskatchewan is not needed to be qualified for either the sub-category of In-Demand Occupation or Express Entry. The process of selection for both the In-Demand Occupation and Express Entry runs on the basis of Expression of Interest. Immigration applicants who would like to be counted for immigration by either sub-category should initially create an E.O.I profile and present the asked information on their education, age, knowledge in English or French, work experience, and additional factors. Profiles are provided a score depends on the answers given, and those with 60 points or higher are accessed into the eligible candidates' pool for either the sub-category of Occupation In-Demand or Express Entry. The weakest score drawn in the Jan 16 draw of Express Entry was 63, and the lowest-ranked In-Demand Occupation applicant had a score of 66.